Is Dockless Bikeshare the Future of ArborBike? I was recently in South Bend for a Notre Dame football game and noted the stunning number of visitors getting around on identical lime green bikes. Students were riding them, drunk tailgaters were hopping from spot to spot and leaving them anywhere they liked, I probably saw close to 100 bikes over a couple hour span. Perhaps unsurprisingly, this is one of the new dockless bike sharing systems in action, LimeBike. I’ve written on Ann Arbor’s bikeshare system, ArborBike, in the past, but as I looked upon more LimeBike riders in a two hour period than I see ArborBikers in an average summer month in Ann Arbor, I couldn’t help but wonder if this was the future for our town. ArborBike is a bike sharing system relying on stations, in this case 13 of them across the greater downtown area. It’s theoretically a great idea and has worked extremely well in larger cities like New York, London and Chicago. The issues here in Ann Arbor are the relatively short travel distances, lack of quality bike infrastructure, and limited number of stations and bikes as a result of high upfront costs. A dockless system solves virtually all of those problems. It works just like it sounds, bikes are picked up and left virtually anywhere, preferred locations are sidewalks and other reasonable places, there are fines for leaving a bike in the street or other dangerous spot. There’s usually a set reasonable radius as well, nice work biking to Milan but you probably couldn’t leave the bike there. Users locate bikes with an app on their phone and rides typically cost $1 for 30 minutes or an hour with longer term plans available as well. There are a litany of new startups in the space, the aforementioned LimeBike is one, others include MoBike, Spin, Ofo and JUMP. As opposed to heavily subsidized public systems, these are for-profit enterprises eagerly deploying in cities, think Uber or Lyft but for bikes. There are 125 bikes in the ArborBike system three years in, there are already 500 LimeBikes in the South Bend system after just a few months. While ridership data is not currently available, I can say unequivocally, it’s exponentially higher. By foregoing stations and using cheaper, lighter bikes, the system can be implemented and expanded rapidly and cost effectively. LimeBike is a good example as they seem to be somewhat focused on college campuses and towns. In addition to South Bend/Notre Dame, they’re in Greensboro, NC at UNC-Greensboro, Raleigh, NC at North Carolina State University and the University of Washington in Seattle. Dockless bikeshare is already huge in China and is entering the United States in a big way, there are four competing systems operating in Washington, DC alone right now. 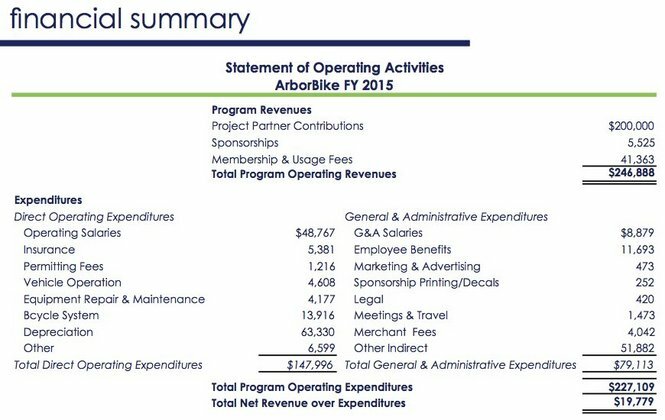 With uncertain funding and the future of ArborBike in doubt, it’s time for Ann Arbor officials and the Clean Energy Coalition (operators of ArborBike) to open a dialog with one or more of these companies. I suspect this is already happening as Sean Reed, Executive Director of the CEC, was familiar with the proliferation of dockless systems nearly a year ago. The service can come quickly and I think most would agree that getting more residents and visitors on clean, healthy bikes is a positive thing. Here’s hoping we see an expansive fleet of shareable bikes on the streets of Ann Arbor in the near future. Did you know Ann Arbor had a bike sharing progam? Based on the 2015 usage statistics, odds are you didn’t, or simply chose not to use the program for any number of reasons. ArborBike launched in 2014 and 2015 was its first full year of deployment. Ridership did not meet expectations the first year but there’s reason for hope going forward, assuming a continued commitment from the city, the AAATA and the University. ArborBike is actually owned and operated by the Clean Energy Coalition in partnership with the institutions mentioned above. Perhaps you’ve seen the sporty blue bikes around town or in one of the 13 stations dotting campus and the greater downtown area. Day passes cost $6, annual memberships will run you $65. In theory, I love the idea of a bike share. It’s great for the environment, eases strain on our notoriously lousy streets and promotes exercise and healthy living. In fact, it’s hard to find fault with it except for the fact that like all other forms of transportation, it requires a public subsidy. Last year the program cost $227K while only bringing in $41K. The University is covering the difference in costs, up to $200K per year for three years as part of the initial pilot program. Initial startup costs of some $750K came in the form of a $600K federal grant and $150K from the city. In the grand scheme of things, not huge dollar amounts but this is public money, it’s important to see results. Initial membership projections were around 10,000 for 2015. Unfortunately the first year only managed to garner 4,474 riders between annual and day passes, a little less than half of expectations. The question is why? Is it typical for cities to start slow? Do we not have enough stations? Is there just not enough marketing and awareness yet? Are we not a bikeable city? To start to understand this, I took a look at a couple of comparable cities to see how we stack up. Both Madison, WI and Boulder, CO have had bike share programs in place for several years and both systems were built out by BCycle, the same company behind ArborBike. Below is the historic ridership data for each city. So we’re not too far behind Boulder for the first year although Boulder is a slightly smaller city than Ann Arbor. There’s also some huge opportunity for growth, Boulder has exploded while Madison has put up big ridership numbers but appears to be tapering. I wanted to look at some other metrics as well, notably station and bike density and per capita ridership. Looking at this data, our stations relative to the size of the city and number of residents was in line with the other cities and Ann Arbor actually had more than enough bikes. Still, ridership was over 30% below Boulder and over 50% below Madison in the first year when looking at trips per 1,000 residents. So our bike share infrastructure seems okay to start with, what’s the reason for the poor ridership? Marketing and exposure is part of it, I believe the city and university could do more to promote the service. But I think the biggest issue is actually the location of the stations and the lack of quality bike lanes and paths in the city. Let’s start with the bike stations and their locations. With the exception of the North Campus locations (numbers 6 and 7), the vast majority of these sites are easily traversable on foot. Granted, they are located near major points of interest and economic drivers but in order to fully realize the system, I believe there needs to be some stations further afield in areas that are really more accessible by bike. Potential locations for expansion that come to mind include Michigan Stadium, Burns Park, Veterans Park, West Park, Nichols Arboretum, Argo Park, Eberwhite, Gallup Park, Briarwood Mall, County Farm Park and Barton Nature Area. Many of these locations are well served by bike lanes and several are along the Border-to-Border Trail which is the city’s best scenic bike route that’s truly accessible from the downtown area. While biking is a great way to get around, an ArborBike tour could make a top 10 list of summer activities for an Ann Arbor visit if it includes the river and the natural treasures of our fair city along with the urban sight seeing. Perhaps most importantly, Ann Arbor needs better bike lane and path infrastructure. The most recent figure I can find is that the city contains 71 miles of bike lanes. Boulder has 160. Beyond that, many of the so-called bike lanes are shared lanes, basically a painting of a bicycle and an arrow on the road in the same right of way as cars. The League of American Bicyclists actually ranks cities based on their “bike friendliness” which includes percentage of streets with bike lanes, percentage of bike commuters, education, safety and a number of other factors. Madison and Boulder both rank “Platinum”, Ann Arbor is certified as “Silver”. UM is rated “Silver” as well while UW earns a “Gold” rating and UC is oddly not rated. (Of note, A2 does rank as the only large city in Michigan to even gain as high as “Silver”). With few exceptions, biking in this town is not nearly as simple, safe and accessible as the city purports it to be. Cyclists in traffic and bikes on sidewalks are common. There have been several tragic accidents in recent years. If we really expect people to bike this city, both locals on their own bikes and visitors on shared bikes, we have a long way to go in terms of promoting an inviting and safe environment. The city needs designated bike lanes and more non-motorized paths like the planned Allen Creek Greenway. Bikeable cities attract young people, are healthier, better for the environment and less congested. ArborBike, supported by the proper infrastructure could be a huge success story for the city. Ann Arbor has the opportunity to be a leader in the bikeable space but it will take an ongoing commitment from the citizens, the city and the university to achieve it.